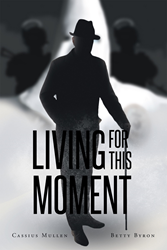 Recent release “Living for This Moment” from Page Publishing author team Cassius Mullen and Betty Byron is an action-packed thriller about a man whose stand for justice resulted in extreme tragedy, a reframing of identity, and a thirst for revenge. Cassius Mullen and Betty Byron, happily married couple and prolific writing team, have completed their new book “Living for This Moment”: a riveting account of a man who will stop at nothing to avenge his wife’s death, and whose lucky break may just lead to that moment which he has been living for. Published by New York City-based Page Publishing, Mullen and Byron’s gripping tale follows an attorney whose former life in New York ended when he involved himself in the wrong side of a case involving a pernicious crime family. Their attempt to murder him via detonation of his vehicle led to the tragic loss of his wife. His life had entirely metamorphosed into something darker; his identity, his career, his wife and his facial appearance were lost to his sense of self. He was no longer Donald Winthrop, assistant district attorney, but Derreck Drummond, a man with an all-consuming mission of revenge. Now a criminal investigator for the Department of Justice, Derreck Drummond becomes no stranger to horror as he travels across the country to assess crime scenes and report his findings. In spite of his reinvention, he cannot forget the death of his wife – the most horrible crime scene of all – and begins to imagine a way that he could use his new life to tie up the loose ends of his old one. Drummond’s dream of revenge merely resides in his weary mind; that is until he stumbles upon a clue in a seemingly unrelated case that may be his ticket to justice. Readers who wish to experience this extraordinary page turner can purchase “Living for This Moment” at bookstores everywhere, or online at the Apple iTunes store, Amazon, Google Play or Barnes and Noble.